My kids love puzzles... I know they would love one with their picture on it! I will add... I think I like the basic designs the best. i like the basic rectangular shape but wonder if they could put a scripture on it.. I would love the 12 in 30 piece cardboard picture puzzle. My kids would love that! Rectangle Piczzle Puzzle in Red Christmas design! Love it! I want one with my family picture on it but the heart is nice too. I like the red christmas frame design. I like the red Christmas design. Very classy. I like the basic Large Cardboard Picture Puzzle. They are all nice though! i want the basic large cardboard picture puzzle. i want to do one with my son! What a fun family activity! The puzzle is cool. Basic Rectangle is the one I like best. I like the rectangle one. It is easier to frame! I like the red Christmas design. Love the Round Basic one! I like the Gold Holiday Design. Really like the I live U design! 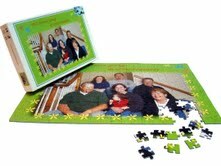 I like the Large Wooden Photo Puzzle in Basic Design. I like the red holiday design!! I love the Holiday Rectangular Design! The Round Happy Birthday Design puzzle is fun! I like the basic heart shaped design, medium 60 pieces wooden. I like the rectangular basic design. Love the Happy Heart Shaped Design! I like the Heart Shaped puzzle! I like the red Christmas frame design puzzle. i love the happy heart puzzle! I really like the holiday design! Super cute!